Romania was the third member of the European Axis powers, casting their lot with Germany in the hope that the Nazis could help them reclaim territory lost to the Russians in the aftermath of World War I. When the tide of the war turned, Romania switched sides, fighting Hitler with his own weapons and supplies. 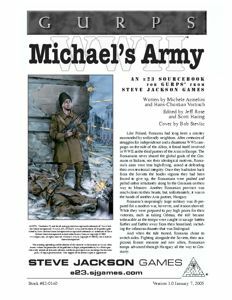 Michael's Army is a sourcebook for GURPS World War II that details Romania's involvement from the early march on Stalingrad to the defense of the Ploesti oilfields to the taking of Transylvania from Hungary. You get complete information on Romanian infantry, armor, air units, and even navy in this supplement. Roleplaying opportunities abound, whether it's the pre-war diplomacy and espionage of King Carol II's court, defending the Black Sea ports from special forces night landings, fighting off American bombing runs on your precious oil refineries, or securing remote Transylvanian estates that the Hungarian occupiers didn't seem all that keen on defending . 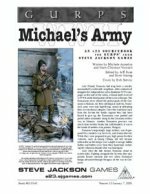 . .
GURPS World War II – An overview of the war that transformed the globe, reviews of the nations and armies in the thick of the fighting, and descriptions of their primary weapons and vehicles.